Aberration is a paid DLC expansion pack for ARK: Survival Evolved. Aberration was released on December 12, 2017 for PC, Xbox One and PS4 at the initial price of $19.99 USD. It is also available for purchase through the season pass. Any creatures tamed and items received can be brought to the vanilla island and used by people with and without the expansion. Items from the DLC can also be spawned manually if you don't own the expansion pack. The intense radiation of Aberration has led to incredible genetic mutations, resulting in new creatures with amazing abilities! Among others, clamber up walls & glide through the air on the back of a camouflaging chameleon-like ‘Rock Drake’, keep the dark at bay with a friendly ‘Bulbdog’, grab and toss multiple creatures simultaneously with a massive ‘Karkinos’, or—if you are talented enough to tame one—command the vile ‘Reaper’ by being impregnated with a horrifying reproductive chest-burster! New tools are on-hand to survive on the world of Aberration, while opening up many possibilities for new competitive and cooperative scenarios. Traverse the ARK using cave-climbing picks, gliding wingsuits, and ziplines. Learn advanced Engrams to dominate the harsh environment, protect yourself with Hazmat Suits, Charge Lanterns, Batteries, Glow Sticks, and much more. Thrive by gathering new resources, using fishing baskets, Gas Collectors, fortify your home within the caverns using cliff structures, and much more! And in the deepest depths of Aberration, their terrifying — yet somehow familiar — master awaits… will YOU be among the survivors powerful enough to face him? Extreme temperatures on the Surface. Seasons that affect the lengths of daytime and night time. Dangerous elemental liquid in the depths of Aberration. Poisonous mushrooms and mushroom spore zones. Plants that can be harvested for Organic Polymer. Black clams that can be harvested for Black Pearls. The map is the underground of a damaged ARK. Most of the features are related to underground, where new Resources exist, such as Fungal Wood and Gems. Rather than being an island, the majority of the map is enclosed underground biomes, making it especially advisable to carry a Compass or GPS to not get turned around in the dark twists and turns. Radiation seeps in at specific locations of the map, causing exposed players not wearing protective gears to take damage over time. Other new strange effects are also a feature. There are three main regions, excluding the surface: The green region being the Fertile, the blue region being the Bio luminescence, and the red region being the Element. Fertile Land do not have any negative effects, Bio luminescence is cold, and Element contains radiation, inflicting both survivors and tamed dinos with Radiation sickness over time without protection. Oil is harder to get, since other than the Trilobite Dung Beetle and rare Seeker drops, the only other natural source of Oil is at the Surface or in the much more difficult area beyond The Spine. 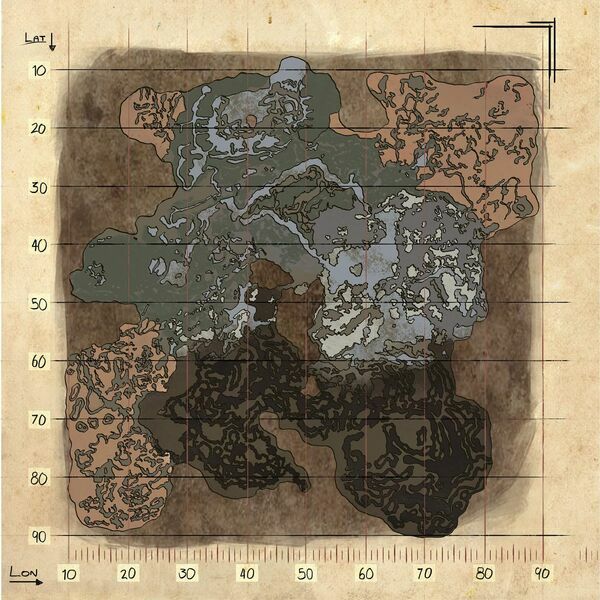 Like the other maps, Beacons only spawn on the surface, but unlike other maps, crates can still be found below the surface, outside of artifact caves, in the form of Loot Crates. A new and fairly vital resource to the game is the Gem, which has three color types found in areas of varying difficulty. Green Gems are found almost immediately upon spawning in the Portal and are found further on in the Fertile region. Blue Gems are found within the Luminescent Biome. Red Gems are found in the more difficult depths of Aberration, in The Spine, Lost Roads, and Element Falls regions. A lesser vital resource Fungal Wood is gathered like regular Wood but from the larger mushrooms scattered around the underground. It substitutes for Wood in recipes, but is explicitly required for making the new structure Shag Rug. Mushrooms appear around the map as a harvestable resource, similar to the bushes found for Berries. However, be careful to avoid the Blue or Red mushrooms found across the map, as these are harvestable but dangerous. Blue mushrooms inflict instant Hypothermia. Red mushrooms inflict hallucination, which can be deadly: side effects other than colorful vision include uncontrollable direction change, constant defecation and its attendant increased hunger, and forgetfulness of breathing - better known as Suffocation, but it ignores Oxygen level of the player as it automatically registers as if the player has 0 Oxygen. Any of these side effects could kill unprepared players. These effects can also harm shoulder-mounted dinos, so be careful. However, eating the Aquatic Mushroom provides temporary immunity to the Freezing Debuff or Luminous Poisons, and eating the Aggeravic Mushroom provides temporary immunity to the Hallucinating Debuff or Fertile Poisons. As the map is mainly underground, Earthquakes often happen which drop random items including Wood, Flint, Rare Mushrooms, Stone, Gems, Obsidian, and Crystal. They also randomly move sleeping survivors that are not anchored to their beds, and cause survivors using a zipline or climbing pick to fall. There are also locations where Element can be crafted, called Charge Nodes. These require resources to craft, and one of the main items needed is Element Ore which is found on The Surface or in The Grave of the Lost. Two new Creatures, the Nameless and the Reaper, emerge with differing frequencies within areas of both the Bio luminescence and Element Regions, in the absence of Charged Light, including inside player-made structures. It is well-advised to keep sources of Charge Light around the base as regular light sources do not prevent them from emerging. Charge Light is usually best provided by the new dinos: Featherlight, Bulbdog, Glowtail, and Shinehorn. Another new creature, the Ravager quickly becomes a survivor favourite as the melee animal of choice, as their damage rapidly stacks with their pack bonus. Nameless and Reaper never spawns here, if they follow you from an surface entrance or other region, they will remain until they lose aggravation, then immediately burrow underground out of sight (possibly) when they reach this region. Dizzy Spores most often happens around this region. Red-Capped Red-stemmed Mushroom and Green Gem cluster are present around the region. Nameless and Reaper King sometimes spawns here. Reaper Queen never spawns here unless kited from Element Region. Bio luminescence Spores most often happens around this region. Cyan-Capped Blue-stemmed Mushroom and Blue Gem cluster are present around the region. Nameless, Reaper King and Reaper Queen (except surface) sometimes spawns here. Element Spores most often happens around this region. Brown-stemmed stalk Mushroom and Red Gem cluster are present around the region. Radiation occurs around certain parts of this region. Nameless, Surface Reaper Kings, and Seekers spawn here. Oil rocks can be mined here in abundance. Beacons drop here very frequently. Rockwell can be fought here. Elemental Reaper Kings and Nameless spawn here. Compared to their standard versions, Aberrant Creatures have 4% less health, deal 6% more damage and glow in the dark. Aberrant Dimorphodon was previously thought to not spawn, but has now been found in some regions of the map. Aberrant Araneo has been known to be sighted around Grave of the Lost and Rockwell Terminal, but much like Dimorphodon, are a rare sight. Also, Aberrant Megalania is immune, but it only exists in the game files without spawning naturally. All imported creatures without the Aberrant mutation and all Aberrant Creatures not included in the above list of those immune, as well as Tek Creatures, are also vulnerable. The most notable radiation-vulnerable creatures are Aberrant Ankylosaurus and Aberrant Doedicurus, due to their high utility in mining. You will need to feed them Mushroom Brew every 120 seconds to keep them from suffering the effects of Radiation. Все предметы из основной игры доступны на Aberration в дополнение к предметам ниже. Так как Aberration является частью истории ARK, Заметки Первопроходцев могут быть найдены по всей карте. Эти Заметки Первопроходцев рассказывают знания о ARK. Для получения более подробной информации см. Заметки Первопроходцев. В добавок к Заметкам Первопроходцев найденным на карте Aberration, могут быть также найдены Досье Динозавров, написанные Хеленой Уокер чтобы задокументировать исследование существ Aberration. Для получения более подробной информации см. Досье Динозавров. Артефакт Потерянных был добавлен в игру с DLC Aberration, но его нельзя получить законным путем. Unlike the main game and the previous DLC Scorched Earth, this expansion pack includes mainly non-existent creatures from fantasy. (e.g: Bulbdog, Nameless, Rock Drake, and Reaper King) The only exceptions are the Roll Rat as it's based on the naked mole rat found in real life, the Lamprey as a real-life counterpart exist as well, and the Glowbug, which is based on the Firefly. The Broken ARK, which is the setting for this DLC, is visible during the Ascension cutscene of the Island if one looks out the windows. According to the end video after defeating Rockwell, it appears you are sent through portal frames in the Element Falls shaft, through the Portal, across space then arriving on what looks like a ruined earth, which is the setting for the DLC Extinction. With the information gathered from the dossiers, it's discovered that Diana (a former survivor of Abberation) is responsible for the scorched Surface, dysfunction of the Obelisks, and the rise of Rockwell as the Overseer of Aberration, when her group destroyed the original Overseer. In the life on Aberration before the damage, it seems the Overseer would have spawned and been located in the same manner as on the Island. However, with the destruction of the Overseer and apparent control center for the ARK, the shields fell as earthquakes began. If you stand near those large crystals sticking out of the roof of some regions, you can hear strange humming. Aberration is currently the only map that allows any creature within an Artifact cave to be tamed. Most other maps have at least one cave which contains creatures that aren’t able to be tamed. Furthermore, it's the only DLC to feature a native dino only tamable in a cave. Prior to Patch 282.102, Tek Teleporter can't be built anywhere within Aberration. Эта страница последний раз была отредактирована 7 февраля 2019 в 07:36.